Summer is here and it is the season to go camping! 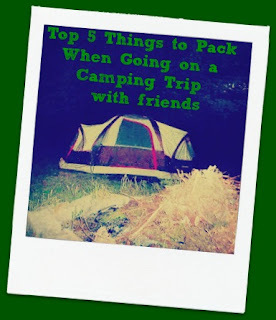 Camping with friends and family in the summer and early autumn can be a lot of fun and be a great way to make memories. While camping is a great time, it can often cause anxiety in preparing for the adventure because there are so many odds and ends to remember to pack. When you travel and stay in a hotel or at a family member’s house, things such as soap, towels, shampoo, and bedding are all provided. Not to mention if you are staying with a friend or family member, they will likely have kitchen utensils and appliances that you can use to cook food. When you go camping, you are likely to not have the luxury of using a stove to cook your dinner. Thus, you will need to prepare and pack more than normal if you are going to set off for a weekend of camping with friends. This article will identify some of the top things you should pack. In order to pack everything you need, you will also need to be sure that you have enough storage to transport all the necessities. We recommend using one of the excellent aerodynamic cargo roof boxes from these guys. Tent. If you want a comfortable place to sleep that will keep the mosquitos and other wild creatures at bay, you will want to make sure that you bring a tent. In addition to the tent, you will need stakes, poles, and a map that will show you how to put the tent together. Be sure to purchase a tent that has enough space for you and your family members as well as a little extra room for moving around. Sleeping bags and pillows. To sleep comfortably in your tent you will want to bring a sleeping bag for each person who will be camping. Also, be sure to pack pillows. Some prefer to use a blow up mattress or a cot when they camp. If you plan to do this, be sure that these items will fit inside the tent that you brought and be sure to bring an air pump along to blow up the mattress. You can either use your sleeping bags to bundle up at night or be sure to bring blankets. Sometimes sleeping on an air mattress can be cooler because of the cool plastic that the mattress is made of. You may want to try it at home first to see how cool you get at night. If you are really chilly, you may want to pack extra blankets. Folding chairs and table. During the day you may be outside exploring the surrounding area or playing games with friends. In between your activities, you will likely want a place to sit and relax as well as eat your meals. Be sure to invest in a small folding table and chairs. This can come in handy when you are eating meals or want to play a game of cards around the camp fire after the sun goes down. Flashlight. A flashlight is always a good idea so that you can see in the dark if you hear a strange noise or need to get something out of your belongings in the middle of the night. Biodegradable soap. You will likely want to bathe which means you need to bring soap along with you. Don’t forget to bring a towel and shower shoes as well as many outdoor showers leave a lot to be desired. Being prepared will make your experience much more fun!